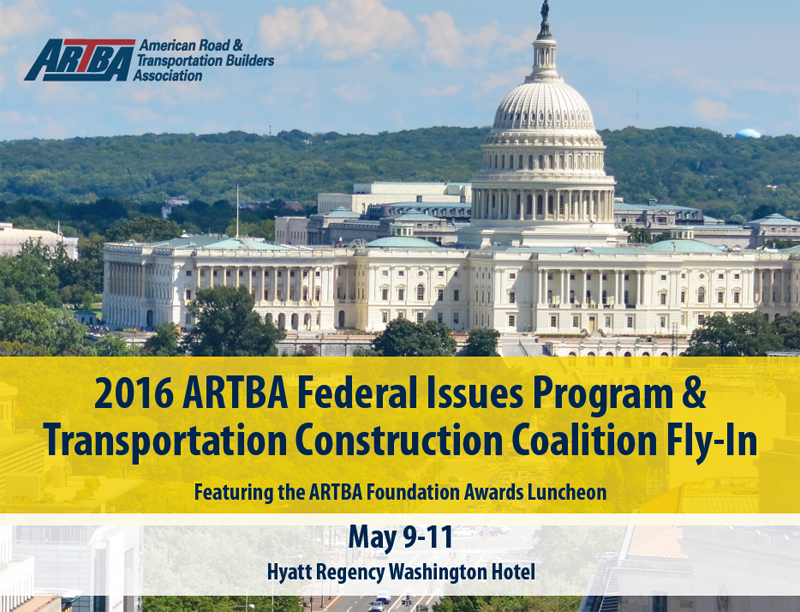 ARTBA’s Federal Issues Program (FIP) and the Transportation Construction Coalition (TCC) Fly-In is a month away. This year’s event is May 9-11 at the Hyatt on Capitol Hill. Register here. A strong industry grassroots presence in Washington is more important than ever in this presidential election year. Our elected leaders need to understand that passing the FAST Act in December wasn’t enough. They’ve still got work to do. We need to push Congress to find a permanent revenue solution for the Highway Trust Fund (HTF). We also have to make sure Congress actually appropriates the funding for the FAST Act’s highway and transit capital programs. This has become an annual fight as inevitably some lawmakers attempt to walk back what was included in the law. Obtaining a multi-year increase in airport capital improvements as part of the FAA reauthorization bill also is likely to still be under consideration in May. Be sure to register soon for the FIP and TCC Fly-In, and we’ll see you in the Nation’s Capital later this spring.